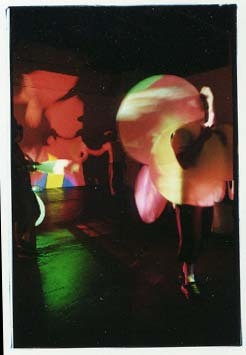 A live video mixing performance where the elements of a video jam are deconstructed and then reassembled. 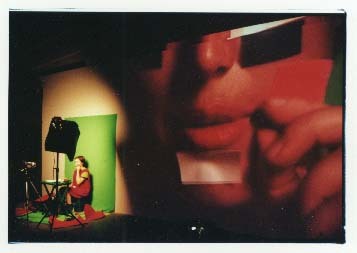 Two weeks prior to the performance, a web searches are made for images and text pertaining to “projection”, “surface”, “mix”, “stereo”, and “screen”. Two performers sit in front of tables at the opposite ends of a large room, facing each other. 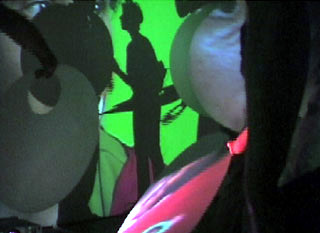 A camera is pointed at each performer and connected to a video projector. 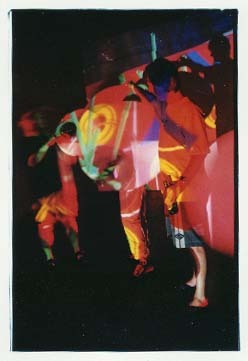 The projectors are pointed at each other and project a live image against the opposite wall. During the event, the images and text found using the search engines are ‘performed’. Text is recited by the performers and they create live reenactments of the images. At the entrance, audience members are given screens to wear. When they enter the room, the two live videos are mixed together on the screens. 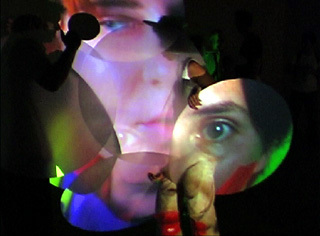 The culmination of screens by the audience, who are always shifting positions within the space, creates a fluctuation and variation of the video that is being projected. 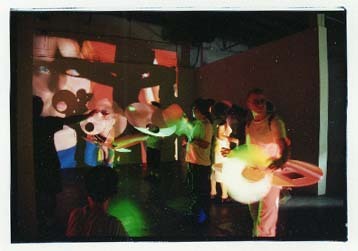 The audience therefore participates in the performative action. Comments closed — Trackback URI RSS 2.0 feed for these comments This entry (permalink) was posted on Friday, February 27, 2009, at 1:51 am by admin. 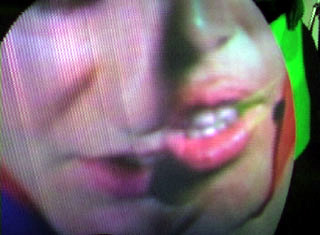 Filed in Performance, Projection.